Looking for a delicious, sustainable Thanksgiving turkey for your holiday meal? Order a Maple Wind Farm turkey today! All Maple Wind Farm turkeys are pasture raised and are moved daily to fresh grass. They are not fed hormones or antibiotics — ever. Turkeys are an important part of Maple Wind’s diversified farm: Beth and Bruce love raising turkeys! 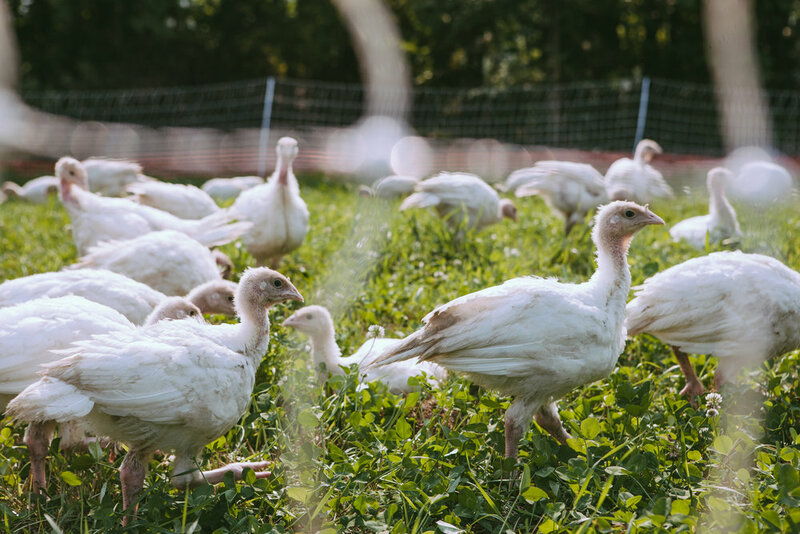 The noticeably improved taste and quality of the meat is a result of the birds’ freedom in the pasture, where they enjoy the grass and bugs and fresh air— turkeys are great foragers! Feed your friends and family with a special turkey this holiday season. Non-GMO turkeys were fed minimal amounts of grain that is Non-GMO to supplement their foraging on pasture. Organic turkeys were fed minimal amounts of Certified Organic grain to supplement their foraging on pasture. Yes - these turkeys cost more than conventional turkeys. What’s behind the price? The careful process of raising birds on organic pasture, the high quality of their supplemental feed, and humane, ethical on-farm processing — unlike conventionally-raised meat, these practices result in a product that’s beneficial for the birds, the land they were raised on, and the farmers who raised and processed them, and is healthier and more nutritious for you to eat! Please order your turkey by Wednesday, November 14th! Pick up Monday November 19 or Tuesday November 20. The general rule of thumb is that you can serve 1 person per pound of turkey. (Don’t forget you’ll want leftovers, too.) Your deposit will go toward the total price of your turkey. When you pick up your turkey here at the Intervale Food Hub, we will calculate the total price based on the exact weight of your turkey. You can pay with cash, check, credit/debit, or the payment source linked to your account. Add the Turkey Deposit of your choice to your cart. There are 3 sizes of Non-GMO and 3 sizes of Organic to choose from. When you’re done, you’ll receive a confirmation email. Contact us to schedule your turkey pick up! At pick up, we will charge you the remaining balance due, based on the actual weight of your turkey. You can pay with cash, check, credit/debit, or the payment source linked to your account.